Bonsoir Chérie: What to wear to cheer up these rainy days in August. What to wear to cheer up these rainy days in August. We should wear only shorts and a shirt in this time of the year but the weather isn't supporting this kind of styling at the moment. So it is raining in the beginning of august. 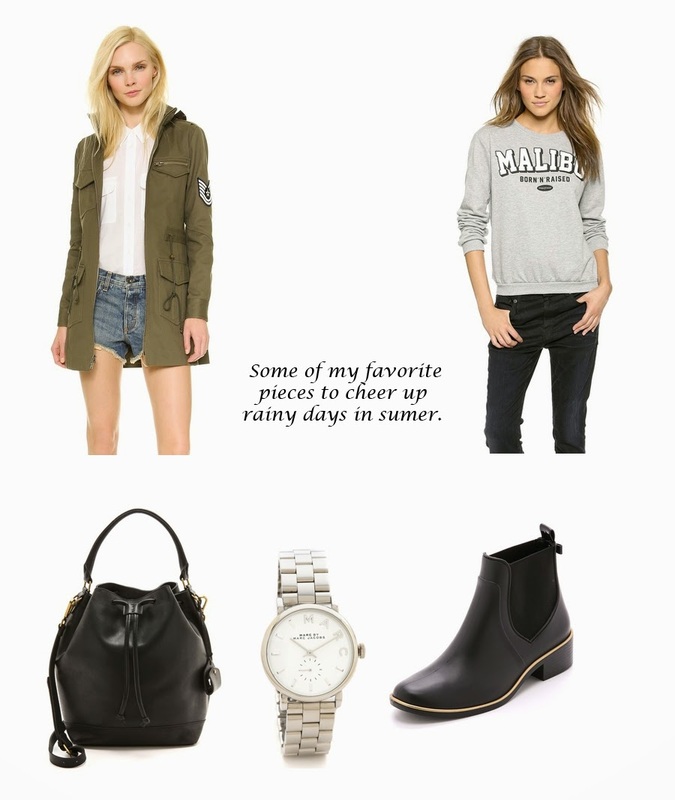 To survive these rainy days in style, I picked my favorite on shopbop. I love the Malibu sweater - as grey is a color that fits to every other color. A classic parka is on my wishlist for a long time now. This one is pretty cool - although but a little bit expensive. And the bucket bag is a perfect every day bag. The silver Marc by Marc Jacobs watch is in my shopping cart - and will soon arrive at my home. And for the rainy days these rubber chelsea boots will cheer me up and keep my feet dry. Tolle Auswahl für regnerische Tage! Den Sweater mag ich ganz besonders.